This wardrobe is the perfect choice for the child bedroom. The flowery pattern catches the eye and the 4 door format is most accessible for the children. The bottom two partitions can be used to store things that are accessed by the children themselves such as books and games. 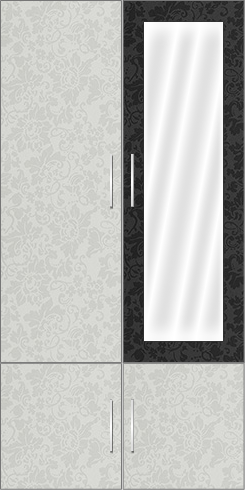 The top partitions can be used to other things and clothes.The right door has a mirror which enables the design to be used a dresser as necessary. Interior: The standard wardrobe layout that has a cloth hanger, removable small shelves and full shelves in the bottom to store bigger things.